The Ropotamo Complex is located 50 km south of Burgas and covers the firth part and the flooded terrace of the Ropotamo river, the natural flooded forests, the sand dunes, the sand strip and the deeply indented coast with rocky capes jutting out into the sea and narrow deep bays, the island of St. Toma, the marshes of Alepu, Arkutino and Stamopolu. To the south and south-east the complex includes mountain ridges with rocks and broadleaved forests. The complex features a great variety of biotopes. A substantial element are the coastal marshes with hygrophyte vegetation, dominated by Phragmites australis, Typha angustifolia, Typha latifolia, Shoenoplectus litoralis, etc. as well as such with hydrophyte vegetation - Nymphaea alba, Hydrocharis morsus ranae, Lemna gibba, etc. Quite characteristic for the complex are the Ropotamo river firth with its hygrophyte and hydrophyte vegetation, including the above mentioned species, the riverine flooded forests of Fraxinus oxycarpa, Ulmus minor, Alnus glutinosa, Crataegus monogyna with considerable participation of liana species. The broadleaved forests are represented mainly by oak forest of Quercus frainetto with Mediterranean elements or mixed with Q. pubescens, Q. virgiliana, etc. The coastal part is occupied by dunes with psamophyte grass vegetation mainly of Ammophilla arenaria, Pancratium maritimum, etc., secondary shrub and grass associations with the prevalence of Paliurus spina-christi, Artemisia maritima, Artemisia campestris, Festuca vaginata, etc. At certain spots the seashore is rocky, with many niches, underwater caves and sea bays. (Meshinev et al. 1982; Bondev 1991; Georgiev 1993). 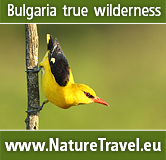 The territory of the Ropotamo Complex currently supports 236 bird species, 69 of which are listed in the Red Data Book for Bulgaria (1985). 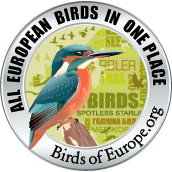 Of the birds occurring there 104 species are of European conservation concern (SPEC) (BirdLife International, 2004), 10 of them being listed in category SPEC 1 as globally threatened, 27 in SPEC 2 and 67 in SPEC 3 as species threatened in Europe. The area provides suitable habitats for 87 species, included in Annex 2 of the Biodiversity Act, which need special conservation measures, of which 83 are listed also in Annex I of the Birds Directive. The Ropotamo Complex is one of the most important places in the country as a breeding site for a complex of species closely dependent on different types of habitats, all presented there - Mediterranean Shearwater Puffinus yelkouan, Spotted Crake Porzana porzana, Little Crake Porzana parva, Purple Heron Ardea purpurea, Squacco Heron Ardeola ralloides and Semi-collared Flycatcher Ficedula semitorquata. It is one of the three places along the Black Sea Coast where the White-tailed Eagle Haliaeetus albicilla is confirmed to breed. Eight globally threatened species have been established there during the breeding season, migration or wintering – Pygmy Cormorant Phalacrocorax pygmeus, Dalmatian Pelican Pelecanus crispus, Marbled Duck Marmaronetta angustirostris, Ferruginous Duck Aythya nyroca, White-tailed Eagle, Pallid Harier Circus macrourus, Greater Spotted Eagle Aquila clanga, Imperial Eagle Aquila heliaca, Lesser Kestrel Falco naumanni and Corncrake Crex crex. 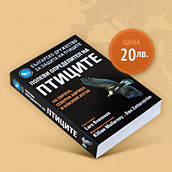 The role of the complex as a transitory station on migration and as a typical bottleneck migration site mainly for the White Stork Ciconia ciconia, Common Buzzard Buteo buteo and some other birds of prey is also considerable. 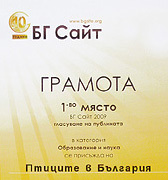 (Michev 1987; Yankov 1993). During the winter Ropotamo Complex holds significant wintering populations of the Black-throated Diver Gavia arctica, Pochard Aythya ferina, Red-crested Pochard Netta rufina and Gadwall Anas strepera. 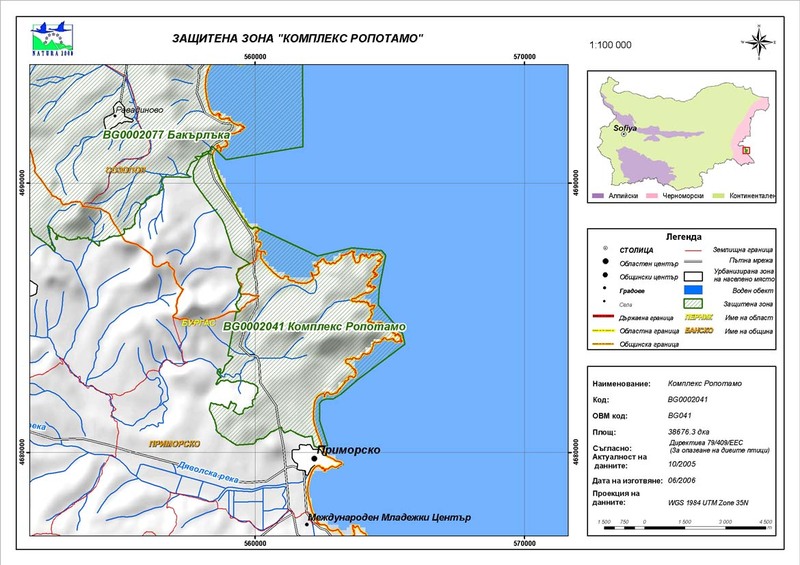 The status of “nature reserve” excludes any activity, but there are some activities in the buffer zone and in the unprotected areas: forestry, hunting, fishery, tourism, recreation, and transport. The main problems of the Ropotamo complex are heavy tourist pressure, building encroachment, and changes to the water regime (caused by upstream water-abstraction, and eutrophication of marshes). The north part of the complex borders a large resort, Dyuni, and the south part borders a town with well-developed tourist facilities. An international road crosses the complex. Illegal cutting in the forests and hunting cause disturbance to birds. Particularly dangerous for migrating birds are the plans for development of wind turbine farms. They will cause disturbed movement and fragmentation of the habitats used by migratory birds. They will be a barrier for thousands of migratory soaring birds and night migrants on their flyway to the south and north and will cause significant mortality of birds and further decline in their populations. So far 52% of the Ropotamo Complex is under legal protection under the national legislation. The “Ropotamo” Managed Reserve was designated in 1940 to protect the diversity of habitats and rich flora and fauna, including birds. In its long history the category of this protected area is changed several times. The other 6 protected areas in the complex are designated to protect the threatened habitats, plant and animal species including birds. Since 1975 the Arkutino Marsh has been designated as Wetland of International Importance under the Ramsar Convention. In 2003 the Ramsar designation is enlarged to the territory of the whole Complex of Ropotamo. The area was designated as Important Bird Area by BirdLife International in 1989. Half of the area was appointed as CORINE Site in 1998 because of its European value for rare and threatened habitats, plant and animal species, including birds.